Gardaí (Irish police) have released the name of the man whose body was discovered in a field in County Meath on Saturday morning. 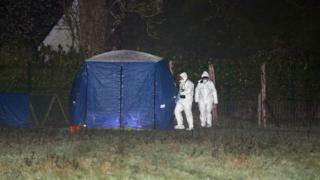 Kane McCormack, 24, was found dead in the townland of Walterstown near Dunboyne. Gardaí said on Sunday evening that a post-mortem had established Mr McCormack died from injuries resulting from three gunshot wounds. Detectives believe he is the latest victim of the Hutch Kinahan feud. Mr McCormack was last seen alive at 17:00 local time on Friday, when he parked his silver Peugeot car in a supermarket car park in Clonee Village. He then got into what gardaí have described as a black saloon car which drove off in the direction of Dunboyne. Shortly after 18:00 local time, gardaí received reports that a black Audi car was on fire at Meakstown Cottages near the M50. Gardaí say they are trying to establish any link between the murder and this black Audi car.